Wonderfully incongruous with the look of the name, Ouarzazate actually means 'without confusion' or 'without noise'. Which is quite true: Ouarzazate is a quiet town at the base of the High Atlas mountains in Saharan Morocco. For many years a way point for traders between Africa and Europe, Ouarzazate has a labyrinthine Kasbah. 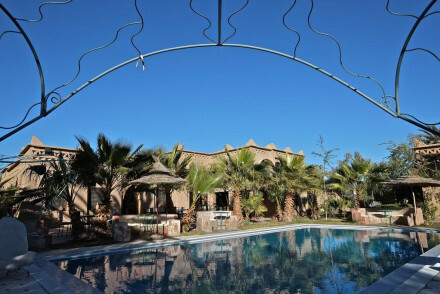 The best places to stay in Ouarzazate make a wonderful base from which to dive into the desert or the mountains. The centre of town has been developed quite a lot over the past couple of years, and it's now a spacious pedestrianised plaza. Quite different from the bustling trade capital rife with livestock as it was for centuries, or the dusty French garrison town that Ouarzazate became in the 1920s. After the French left in the '50s Ouarzazate became a location darling of the film industry, and still is! It's played Tibet, Somalia, Ancient Rome and Egypt, among others. You might still recognise Ouarzazate in Game of Thrones. If you fancy a trip to a film set, visit Atlas Studios where you can see sets from Cleopatra, Asterix & Obelix, Gladiator and Lawrence of Arabia, to name just a few. Ouarzazate is a day trip's distance from Ait Benhaddou, one of Morocco's best-preserved Kasbahs, and a World Heritage Site. The Dades Valley runs between Bourmaine and Ouarzazate, and between these two oases are a string of little fortified villages beyond which is rose country, then date and henna country. Followed by the 300 metre high walls of Todra Gorge. Ouarzazate is also a good base for an overnight experience in the dunes at M'Hamid, a small village in the Zagora region, and one of the last pockets of civilisation before the vast ocean of the Sahara. After M'Hamid it's just sand, shepherds and caravan trails. Use our guide to the best places to stay in Ouarzazate and start to plan your off-the-beaten track Moroccan adventure. Dar Ahlam is a traditional Kasbah, transformed into a luxury retreat. Sumptuous suites and private villas provide the comfortable sleeping arrangements, while the hammam and giant pool will help bring you back to life after time in the desert. Wow. In a Wow setting. Undoubtedly one of the best places to stay in Ouarzazate! Set in a wonderfully remote location between the Atlas Mountains and the Sahara Desert, Sawadi offers traditional rooms oozing rustic charm - complete with warm pink walls, fireplaces and woven rugs. Plus, there's even a spa and an organic restaurant at this laid back spot. If you've decided that you'd like the privacy of a self-catering option then browse through the wide variety available online with our partner, booking.com. You're probably best off visiting Ouarzazate in the shoulder-season months, from April to May or September to November, when the weather's a comfortable 15-25°C. The summer months are blisteringly hot which makes daily sightseeing a bit of a challenge. Another popular option is visiting around Christmas, though this is usually a pretty busy time so expect a number of fellow tourists and to pay more for accommodation. International visitors can fly into Ouarzazate Airport, located just 2km outside the city centre. You can take a taxi to the airport for around 50 dirhams per person (£10), or instead prebook a shuttle service. There are unfortunately no direct flights from the UK to Ouarzazate, most require at least one changeover - usually at Casablanca Airport. The journey time is anywhere from 6 hours 30 mins plus. 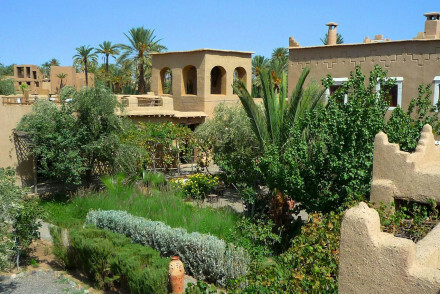 Browse through our list of all the best places to stay in Ouarzazate. Alternatively, check out our recommendations for places to stay in the High Atlas. Traditional kasbah in Skoura's Palmeraie, four hours from Marrakech, transformed into a luxury and spoiling retreat. 14 sumptuous suites & villas, plus hammam, large pool & plenty of activities including quad safaris or hiking. Tailor made excursions including private dining under the desert stars.